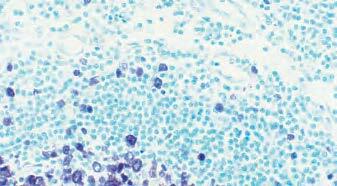 A counterstain introduces color to specific cellular structures to provide contrast to the colored enzyme substrate. Counterstaining aids in visualization and target localization, facilitating interpretation of morphology and cell structure within the tissue section. Our nuclear counterstains are packaged as convenient, ready-to-use solutions for use on individual slides or in staining dishes. 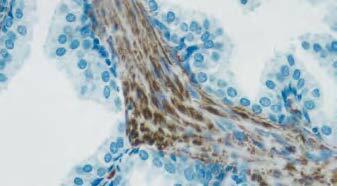 Tumor tissue section showing specific cytoplasmic cell staining (Vector® DAB, brown) with Vector® Hematoxylin QS counterstain (blue). Tonsil section showing specific cell staining (Vector® VIP, purple) with Vector® Methyl Green counterstain (green). 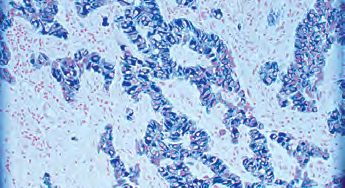 Tumor tissue section showing specific cytoplasmic cell staining (Vector® SG, blue/ gray) with Vector® Nuclear Fast Red counterstain (red).